I’ve mentioned in previous posts that I try to be a flexatarian. Meaning, I follow mostly a plant based diet, but will eat a little meat. However there are some times where the gloves are off and the whole plant based diet thing goes way out the window. 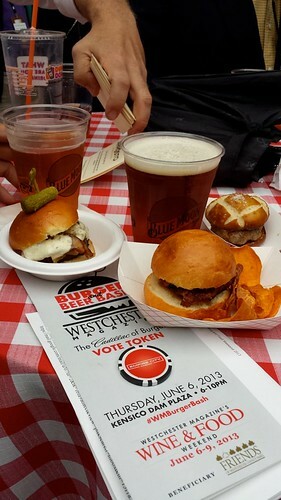 A Burger & Beer Bash is one of those times. 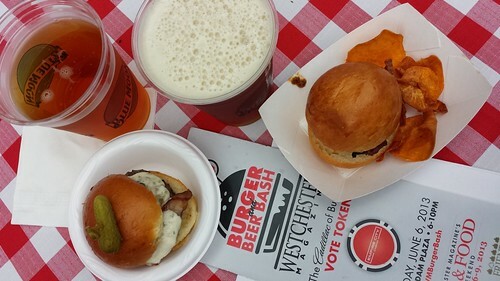 As part of Westchester Magazine’s Food & Wine Festival weekend, they hosted the Burger & Beer Bash. When I found out about it, I was all over it. The ticket price was a bit steep ($65). But, to me this meant that this was going to be an orderly event. I’ve been to festivals where admission was free but the food was not, and those are always a mess of all sides of humanity filled with long lines and everyone running out of food. Plus I’m not a fan of wall to wall people. 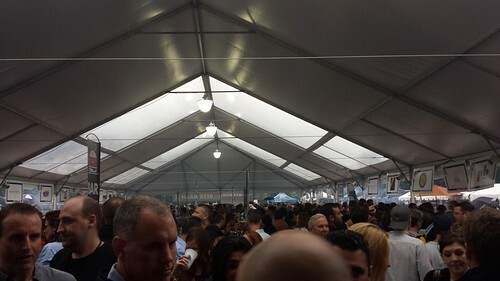 It was a rainy Thursday night, which meant everyone hung out under the large tent. This created the wall to wall of people, but it at least it was orderly. Getting through took time, but wasn’t too annoying, which was nice. Plus it let me test out my theory of the most efficient way to touch people to get them to move out of the way. There were 28 restaurants pushing their slider sized burger samplings to hopefully win my vote for the “Cadillac of Burgers”. As for beer selections, there was a few choices from Captain Lawrence (including my favorite Liquid Gold) and from Blue Moon. I tried the Tongue Thai-ed offering from Blue Moon. It was really good, and very well spiced. Something to keep an eye out for! As for the 28 offerings? Of the 28 restaurants, we opted to skip 3 of them (Westchester Burgar Company, Lazy Boy Saloon and BGR) since we had been to the restaurants (and had their burgers) already. So, that left 25 to work through. We rocked it. Dan Rooney’s Cafe & Bar: (Beef burger with brie, honey mustard, watercress & tangy onions) – The combination of honey mustard and brie on a burger was super. It was also one of the last ones we tried, so at this point I was pretty much burgered out and everything started tasting the same. But, this one did stand out. Good Life Gourmet (Umami burger with onion jam, thick bacon, and beemster cheese, using beef from Hemlock Hills Farms): Very well cooked meat and perfectly spiced. Rye Roadhouse (Bacon Explosion: Homemade sausage patty wrapped in bacon): In a sea of beef burgers, the sausage patty wrapped in bacon was a nice change. X2O (The French Cowboy: ground aged beef, Hudson Valley Foie Gras, tomato and mustard seed compote and spicy togarachi mayo served on a pretzel bun): The pretzel bun was awesome. The whole burger was pretty delicious too. 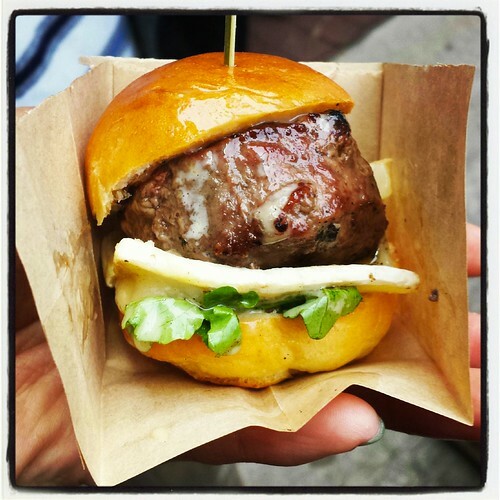 The Ritz-Carlton: Westchester (Teriyaki Kobe Burger with onion jam, foie gras butter, spiced brioche): Great burger, great meat, great combination. 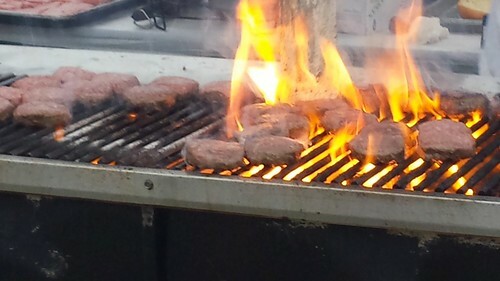 Who knew the Ritz made such a great burger…bet it costs an arm and a leg. MP Taverna (Gyro spiced beef sliders with spicy pepperoncini and onion): Love the gyro spiced beef. Great spicy kick from the sauce. 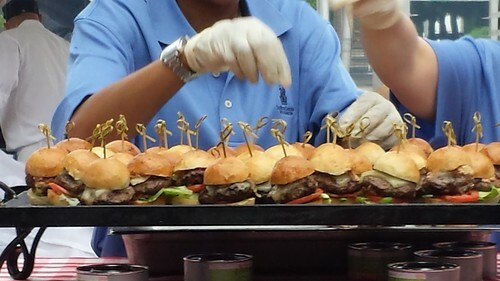 Birdsall House (Hemlock Hill pork sliders with apple butter and bacon onion chutney): The pork sliders were delicious. it was a nice change from all the beef. Cedar Street Grill (The Cedar Street Burger: 80/20 blended certified angus beef on a brioche bun with applewood smoked bacon, carmelized onion, Wisconson white cheddar cheese and horseradish aioli): I’ve come to love Cedar Street Grill and every time I have a meal there, I love it even more. Too bad it’s in Dobbs Ferry! Now I must go and get the real sized burger. Piper’s Kilt (Piper’s Kilt traditional cheeseburger with sauteed onions): If you are going to be great at burgers, you have to master the basics first. I felt like Piper’s Kilt did just that. It was a no nonsense burger, just beef, cheese and onions, and it was so delicious. As I was finishing off the slider, I felt like I could eat that burger all day. 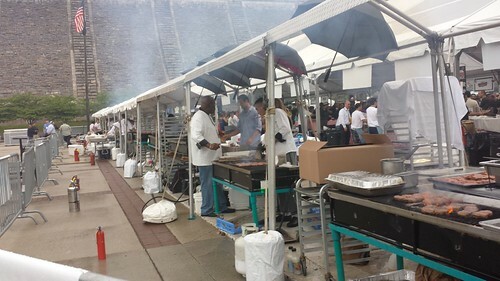 This entry was posted in Beer, Dinner, Festival and tagged Birdsall House, Blue Moon, Burger Beer Bash, Captain Lawrence, Cedar Street Grill, Dan Rooney's Cafe and Bar, Good Life Gourmet, MP Taverna, Park and Recreation, Piper's Kilt, Ritz Carlton Westchester, Rye Roadhouse, Westchester Magazine, X2O. Bookmark the permalink.